Can one person make a difference? What the evidence says. It’s easy to feel like one can person can’t make a difference. The world has so many big problems, and they often seem impossible to solve. We learned that while many common ways to do good, such as becoming a doctor, have less impact than you might first think; others have allowed certain people to achieve an extraordinary impact. In other words, one person can make a difference, but you might have to do something a little unconventional. In this article, we start by estimating how much good you could do by becoming a doctor. Then, we share some stories of the highest-impact people in history, and consider what they mean for your career. How much impact do doctors have? So, we wondered: how much difference does becoming a doctor really make? Since a doctor’s main purpose is to improve health, we tried to figure out how much extra “health” one doctor actually adds to humanity. We found that, on average in the course of their career, a doctor enables their patients to live an extra combined 140 years of healthy life, either by extending their lifespans or by improving their overall health. There is, of course, a huge amount of uncertainty in this figure, but the real figure is unlikely to be more than ten times higher than 140. Using a standard conversion rate (used by the World Bank among other institutions) of 30 extra years of healthy life to one “life saved,” 140 years of healthy life is equivalent to 5 lives saved. This is clearly a significant impact, however it’s less of an impact than many people expect doctors to have. Researchers largely agree that medicine has only increased average life expectancy by a few years. Most gains in life expectancy over the last 100 years have instead occurred due to better nutrition, improved sanitation, increased wealth, and other factors. Doctors are only one part of the medical system, which also relies on nurses and hospital staff, as well as overhead and equipment. The impact of medical interventions is shared between all of these elements. Most importantly, there are already a lot of doctors in the developed world, so if you don’t become a doctor, someone else will be available to perform the most critical procedures. Additional doctors therefore only enable us to carry out procedures that deliver less significant and less certain results. This last point is illustrated by the chart below, which compares the impact of doctors in different countries. The y-axis shows the amount of ill health in the population, measured in Disability-Adjusted Life Years (aka “DALYs”) per 100,000 people, where one DALY equals one year of life lost due to ill health. The x-axis shows the number of doctors per 100,000 people. DALYs per 100,000 people versus doctors per 100,000 people. We used WHO data from 2004. Line is the best fitting hyperbola determined by non-linear least square regression. Full explanation in this paper. You can see that the curve goes nearly flat once you have more than 150 doctors per 100,000 people. After this point (which almost all developed countries meet), additional doctors only achieve a small impact on average. So if you become a doctor in a rich country like the US or UK, you may well do more good than you would in many other jobs, and if you would be an exceptional doctor, then you’ll have a bigger impact than these averages. But it probably won’t be a huge impact. In fact, in the next article, we’ll show how almost any college graduate can do more to save lives than a typical doctor. And in the guide, we’ll cover many other examples of common but ineffective attempts to do good. These findings motivated Greg to switch from clinical medicine into public health, for reasons we’ll explain over the rest of the guide. Who were the highest-impact people in history? 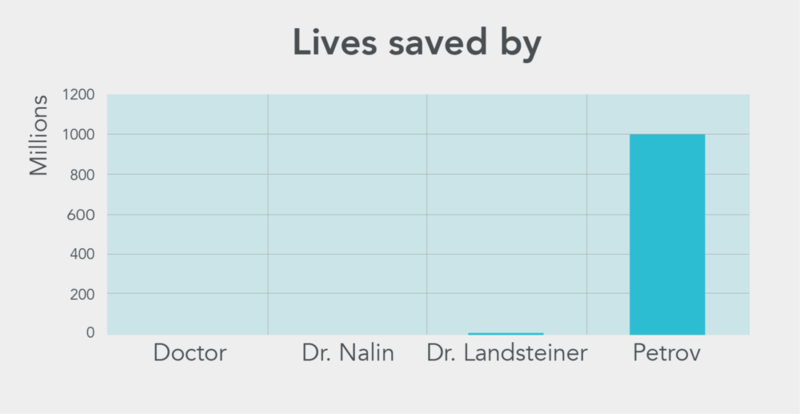 Despite this uninspiring statistic about how many lives a doctor saves, some doctors have had much more impact than this. Let’s look at some examples of the highest-impact careers in history, and see what we might learn from them. First, let’s turn to medical research. In 1968, while working in a refugee camp on the border of Bangladesh and Burma, Dr. David Nalin discovered a breakthrough treatment for patients suffering from diarrhea. 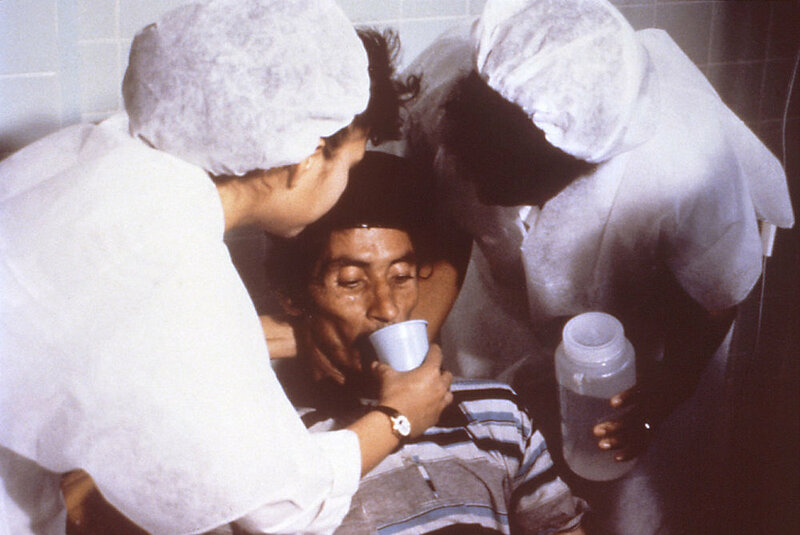 He realised that giving patients water mixed with the right concentration of salt and sugar would rehydrate them at the same rate at which they lost water. This prevented death from dehydration much more cheaply than did the conventional treatment of using an intravenous drip. Dr. Nalin helped to save millions of lives with a simple innovation: giving diarrhoea patients water mixed with salt and sugar. Since then, this astonishingly simple treatment has been used all over the world, and the annual rate of child deaths from diarrhea has plummeted from 5 million to 1.3 million. Researchers estimate that the therapy has saved about 50 million lives, mostly children’s. But even just within medical research, Dr. Nalin is far from the most extreme example of a high-impact career. For example, one estimate puts Karl Landsteiner’s discovery of blood groups as saving tens of millions of lives. Leaving the medical field, later in the guide, we’ll cover the story of a hugely impactful mathematician, Alan Turing, and bureaucrat, Viktor Zhdanov. Or, let’s think even more broadly. Roger Bacon and Galileo pioneered the scientific method, without which none of the discoveries we covered above would have been possible, along with other major technological breakthroughs like the Industrial Revolution. These individuals were able to do vastly more good than even outstanding medical practitioners. Or consider the story of Stanislav Petrov, a Lieutenant Colonel in the Soviet army during the Cold War. In 1983, Petrov was on duty in a Soviet missile base when early warning systems apparently detected an incoming missile strike from the United States. Protocol dictated that the Soviets order a return strike. But Petrov didn’t push the button. He reasoned that the number of missiles was too small to warrant a counterattack, thereby disobeying protocol. If he had ordered a strike, there’s at least a reasonable chance hundreds of millions would have died. The two countries may have even ended up engaged in an all-out nuclear war, leading to billions of deaths and, potentially, the end of civilisation. If we’re being conservative, we might quantify his impact by saying he saved one billion lives. But that could be an underestimate, because a nuclear war would also have devastated scientific, artistic, economic and all other forms of progress leading to a huge loss of life and well-being over the long run. Yet even with the lower estimate, Petrov’s impact likely dwarfs that of Nalin and Landsteiner. What does this spread in impact mean for your career? We’ve seen that some careers have had huge positive effects, and some have vastly more than others. Some component of this is due to luck – the people mentioned above were in the right place at the right time, affording them the opportunity to have an impact that they might not have otherwise received. You can’t guarantee you’ll make an important medical discovery. But it wasn’t all luck: Landsteiner and Nalin chose to use their medical knowledge to solve some of the most harmful health problems of their day, and it was foreseeable that someone high up in the Soviet military could have a large impact by preventing conflict during the Cold War. So, what does this mean for you? People often wonder how they can “make a difference”, but if some careers can result in thousands of times more impact than others, this isn’t the right question. Two career options can both “make a difference”, but one could be dramatically better than the other. Instead, the key question is, “how can I make the most difference?” In other words: what can you do to give yourself a chance of having one of the highest-impact careers? Because the highest-impact careers achieve so much, a small increase in your chances means a great deal. The examples above also show that the highest-impact paths might not be the most obvious ones. Being an officer in the Soviet military doesn’t sound like the best career for a would-be altruist, but Petrov probably did more good than our most celebrated leaders, not to mention our most talented doctors. Having a big impact might require doing something a little unconventional. So how much impact can you have if you try, while still doing something personally rewarding? It’s not easy to have a big impact, but there’s a lot you can do to increase your chances. That’s what we’ll cover in the next couple of articles. But first, let’s clarify what we mean by “making a difference”. We’ve been talking about lives saved so far, but that’s not the only way to do good in the world. Everyone talks about “making a difference” or “changing the world” or “doing good” or “impact”, but few ever define what they mean. The number of people whose lives you improve, and how much you improve them. This means you can increase your social impact in two ways: by helping more people, or by helping the same number of people to a greater extent (pictured below). We also include the lives you improve in the future, so you can also increase your impact by helping in ways that have long-term benefits. For example, if you improve the quality of government decision-making, you might not see many quantifiable short-term results, but you will have solved lots of other problems over the long-run. Optional: Why did we choose this definition? Many people disagree about what it means to make the world a better place. But most agree that it’s good if people have happier, more fulfilled lives, in which they reach their potential. So, our definition is narrow enough that it captures this idea. Moreover, as we’ll show, some careers do far more to improve lives than others, so it captures a really important difference between options. If some paths can do good equivalent to saving hundreds of lives, while others have little impact at all, that’s an important difference. But, the definition is also broad enough to cover many different ways to make the world a better place. It’s even broad enough to cover environmental protection, since if we let the environment degrade, the future of civilisation might be threatened. In that way, protecting the environment improves lives. Many of our readers also expand the scope of their concern to include non-human animals, which is one reason why we did a profile on factory farming. That said, the definition doesn’t include everything that might matter. You might think the environment deserves protection even if it doesn’t make people better off. Similarly, you might value things like justice and aesthetic beauty for their own sake. In practice, our readers value many different things. Our approach is to focus on how to improve lives, and then let people independently take account of what else they value. To make this easier, we try to highlight the main value judgments behind our work. It turns out there’s a lot we can say about how to do good in general, despite all these differences. How to measure social impact? We are always uncertain about how much impact different actions will have, but that’s okay, because we can use probabilities to make the comparison. For instance, a 90% chance of helping 100 people is roughly equivalent to a 100% chance of helping 90 people. Though we’re uncertain, we can quantify our uncertainty and make progress. Moreover, we can still use rules of thumb to compare different courses of action. For instance, in an upcoming article we argue that, all else equal, it’s higher-impact to work on neglected areas. So, even if we can’t precisely measure social impact, we can still be strategic by picking neglected areas. We’ll cover many more rules of thumb for increasing your impact in the upcoming articles. So how can you improve lives with your career? In the next article, we’ll cover how any college graduate can make a big impact in any job. Then, after that we’ll cover how to choose a job in which you can do the most good possible. "How Much Good Can One Person Do? Here's What the Evidence Says." 80,000 Hours, 80000hours.org/career-guide/how-much-difference-can-one-person-make/.